Accessed by the A614 highway, Sherwood Forest makes a great getaway close to Nottingham city. Rather reduced from the green splendour it evinced in the days of Robin Hood, Sherwood Forest is nevertheless as ecologically important and interesting as it is historically. 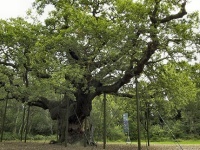 Around 500,000 visitors a year come to enjoy Sherwood Forest Country Park, wandering the family nature trails, and admiring the huge ancient oaks and teeming insect and bird life. A big attraction is the mighty Major Oak, still flourishing in the forest after 800 years. Sherwood Forest is also the site of the popular Robin Hood Festival, held annually in summer.